We've had a "bit" of snow here this year. So far we've got well over a foot of snow on the ground. 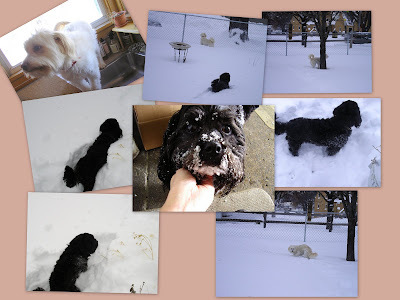 Here are some pictures of the boys playing in the snow. And, yes, it's over Elvis' head! It looks like he was using his nose to tunnel. Cute! Elvis looks like he made a full recovery. Happy Holidays, Sally! Great photos!!! Poor lil Elvis! A Very Merry Christmas to you and your family Sally!! You need to tie a couple of snow shovels to the dogs... get some work out of 'em in exchange for all that dog food. I'd make my dogs do it but they're both working 2nd shift at the toilet float factory tonite. I don't "get" that marco carpy dude... it's like he's speaking a different language or something. Cowguy - Uh...ya. It's Italian. LOL He takes cool pictures tho. Have a Great New Year Sally! Hey Darlus! Same to you hun. A very happy and prosperous new year to you Sally!!! How fun to watch the 'kids' enjoying the snow. Thank you for your sweet comments about Fancy. You know how we miss her! You are being very quiet here. You're right my salt container came from our last trip to Paris and it always brings that back everytime I use it. Hey Sally, there's something for you over at my blog! Hope you're staying warm in this hell we call winter! Hi Sally, How are you doing? Isn't this Iowa winter the pits??? My Rosie loves the snow but it is too deep for her to even plow through right now, Quasi Boy makes paths for her, he and Erin are not so crazy about the snow. How cute!! The snow isn't cute but the dogs are. I do not envy you guys with all of the white stuff. It makes me cold just looking at it.